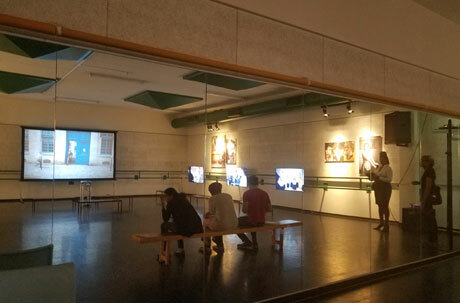 This five-screen installation puts forward different contexts of precarity in today’s global society. Everything, from health to relationships to labour rights and human rights as well as economic survival is precarious. We attempt to bind these areas together in their audio-visibility. 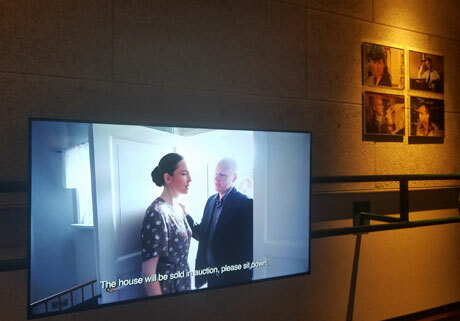 Based on Flaubert’s prophetic novel Madame Bovary from 1856, our five screens show the precariousness of an adult life beginning; the world that seduces her into risking what she has and craving for what she doesn’t; and when, grasping at last straws, she takes more and more dangerous turns, and thus, inevitably, she ends in misery, both economically, psychically, and physically. Meanwhile, from the edge of the space where her life plays out on four screens, we see how this is not an individual ill nor a blameable transgression but something towards which she has been pushed all along by her surroundings. Especially the meddling pharmacist Homais represents the probing of the curious and the rejoicing in Emma’s misfortune and downfall, as we see in Probing and Meddling. In Shaping and Moulding the young woman is being educated in and outside school, and educating herself with activities inspired by her cultural environment. In Seduction she is lured into adventures that promise her a more fulfilling life, but instead, give her heartbreak and unsolvable debts. Nothing is what it seems. Last Straw presents her ultimate, desperate attempts to happiness, but only confronts her with the impossibility of achieving it in the social passivity she has been raised to cultivate. Hence, in Endings we witness the inevitable denouements such striving and failures entail: financial ruin, divorce, mental breakdown, death. So far, this small installation has been exhibited three times. 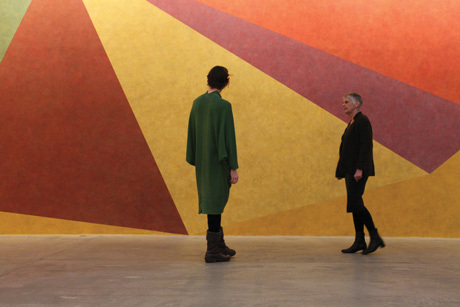 In the National Gallery in Prague, it had a floor of its own, in a beautiful group show The Importance of (Being) a Moving Image, rated by Adam Budak and Jen kratochvil, February 20 - May 24, 2015. 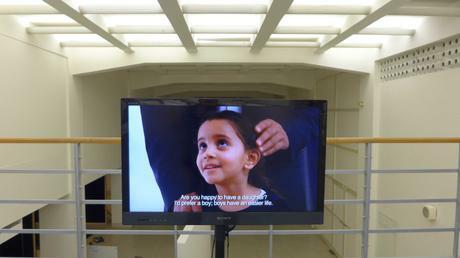 For this, see under group exhibitions: The Importance of Being a (Moving) Image, Prague. 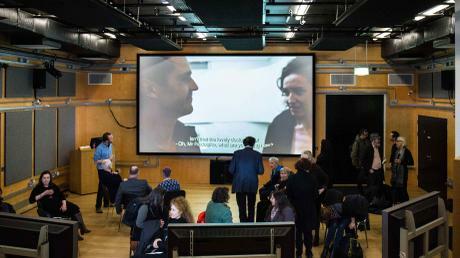 In Utrecht, for just one day, it was shown as an accompaniment of my keynote lecture in the conference Re-Interpretation: A Conversation on Power Structures” Utrecht, 5 February 2016. In Dublin, at Deleuze and Art, Trinity College, Dublin, it was installed 6-10 April 2016. 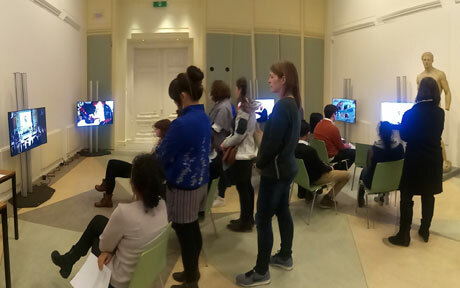 A very reduced account of the the Humanities Student Conference in Utrecht, “Re-Interpretation: a Conversation on Power Structures” is here. 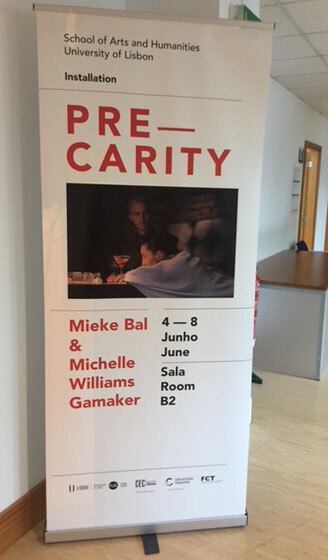 In Lisbon, our installation drew a lot of public from non-university corners. Later, I discovered the reason for this. 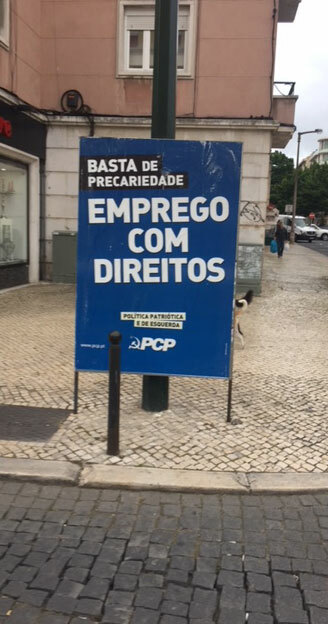 During the exhibition, the people ofLisbon were protesting against precarity in their own lives and jobs. The new season opens on the Politics of Boredom, organized by Aylin Kuryel. Her Turkish background is no stranger to the topic of precarity. 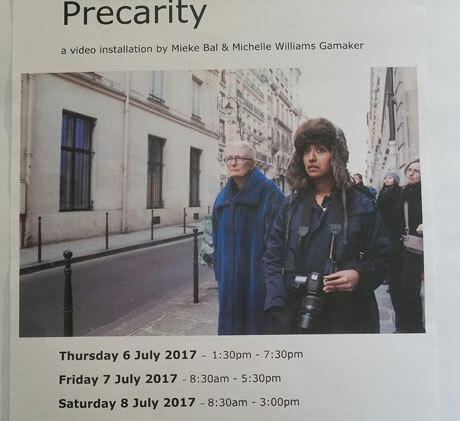 It has been a busy season for Precarity. Too many installations to document them all. Most were in the context of a conference. This yielded exactly the kind of interest called “artistic research” that I am intensely invested in these days. This interest, which began in 2002 when I started to make films, has now reached a more “official” turn. I am applying for a grant together with Norwegian artist Jeannette Christensen to develop this turn in more depth. While Jeannette takes her starting point in the history of painting (Johannes Vermeer) I keep returning to literary classics. After Flaubert, with his early insight in “emotional capitalism”, I am now examining how to audio-visualize the traumatic structure of Cervantes’ Don Quixote. Whether or not we win this lottery, the process of thinking together about it has been productive already. For more on this project, see Film Projects. I hope to find the opportunity to begin filming in late April 2019, until the end of next Summer.